Where could I look up the name that I should use in the createElement command? Ｉ reckoned from the exported xmi, that I could add a class and then add stereotype block (maybe using createClass command), but where do I look up the name of the stereotype that I should use? First, if you want to know the kind of element currently selected in order to use it in the createElement command just go to the "Properties" tab. You will find it as depicted below. 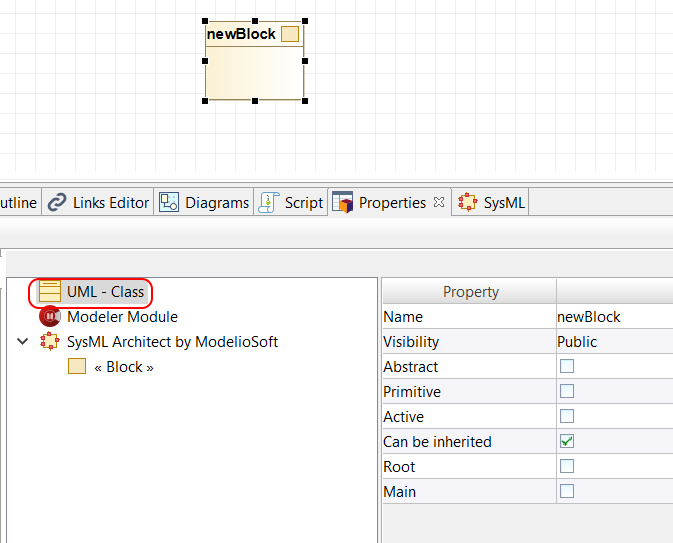 Now concerning SysML Blocks.You are right, a SysML Block is a UML Class on which the SysML Block stereotype is applied. So to create a SysML Block in Jython you can use your code or the following one which is shorter. Reading more in the forum, I found that it is also very handy to use the Semantic model View to under the underlying data structure.